Eddie Eagle is never shown touching a firearm, and he does not promote firearm ownership or use. The program prohibits the use of Eddie Eagle mascots anywhere that guns are present. 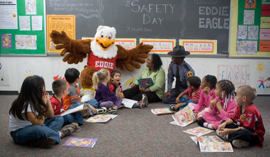 The Eddie Eagle Program has no agenda other than accident prevention -- ensuring that children stay safe should they encounter a gun. The program never mentions the NRA. Nor does it encourage children to buy guns or to become NRA members. The NRA does not receive any appropriations from Congress, nor is it a trade organization. It is not affiliated with any firearm or ammunition manufacturers or with any businesses that deal in guns and ammunition. group and are based on the individual maturity of each child. Course description: Your child will be provided with the opportunity to learn the proper way to handle firearms from an NRA certified firearms instructor. In this interactive class, children will learn safety, firearm function and operation, and the fundamentals with range time (shooting)! Students age 7 thru 10 will have the opportunity to shoot BB or pellet guns. Students age 11 and older will have the opportunity to shoot .22 caliber pistols and rifles. Your child must be mature enough to handle a firearm with close supervision. As a parent you know how important this is and that children will listen to an instructor more readily than they will listen to their parents. Parents are expected to have a basic understanding of firearms and firearm safety. A PARENT IS REQUIRED TO BE PRESENT WITH THEIR CHILD FOR THE ENTIRE CLASS! HOWEVER, REMEMBER THAT YOUR CHILD IS THE STUDENT – NOT YOU! Your encouragement and support of your child throughout the class is most helpful.